There is a huge difference between profits and cash flow. A business can be very profitable but still have poor cash flow - profits are no guarantee that you won't run into a cash flow problem. Even the big businesses can feel the effects of cash flow restrictions. In high level, layman's terms, profit is what you make on your sales, your profit margin. Cash flow is how the money from sales moves through your business against your costs. So profit is what you make when you subtract your costs from what you charge for your products or services. For example, if you sell a box of office supplies at £1,000, and they cost you £700, you are making £300 profit on the transaction. In these costs I am including the cost of the product (or the raw materials if you are a manufacturer), and any staff costs, or other expenditure required to produce your product. In practice this will include all sorts of other expenditure such as for premises, marketing, distribution, equipment, staff wages and many other possible costs. If costs were to exceed your sales, you would make a loss. If your costs are less than your sales, you make a profit. Cash flow is the flow of money through your organisation, it is about the timing with which your costs have to be paid, and your income is received. So you can have a positive cash flow, where you are receiving more money that you have to pay out, or a negative cash flow - where you have to pay out more than you are receiving. The timing of payments both outward, and inward is critical in understanding the cash flow cycle of your company. You receive an order for a box of office supplies, you agree a price of £1,000. No deposit or up front payment can be charged, as you had to win the deal from another supplier that offers 30 days credit terms to customers. Therefore you will have to offer the same terms to your customer. You have to purchase the office suppliers paying cash up front, the purchase cost was £700 (this could include any of the other costs described above, in addition to just the cost of purchasing the stock - but lets keep the example simple). You may not be able to get a credit account from your supplier, or you may have already reached your credit limit with them in respect of previous supplies - hence you have to pay cash up front. Your position is now that you have had to find a way to pay the £700 to your supplier, this could be via cash you have on hand, an overdraft or other form of business funding. Either way, at this point you are £700 down and you have the risk that your customer might not pay at all (you can protect yourself against the risk of not being paid by customers). You deliver the box of supplies to your customer, and raise your invoice for £1,000 on 30 day terms. You have made an "on paper profit" of £300 at this point, but in practice, you have a cash flow gap of £700 as you had to fund the purchase of the stock and you haven't been paid yet. If you were to use an invoice finance facility at this point you would receive the bulk of that cash immediately, but this example assumes that you don't. Your customer finally pays (after you had to chase the customer for payment several times), but they took 60 days to settle your invoice (not just the 30 you granted them), so you had to carry the £700 costs for much longer than expected. At this point your cash position is now positive again, the £1,000 is received, so after you repay the purchase costs (assuming you borrowed it - lets ignore interest for ease) you have £300 (your profit margin) on hand. So you can see that profitability and good cash flow are completely different. A company can be profitable, but suffer poor cash flow. 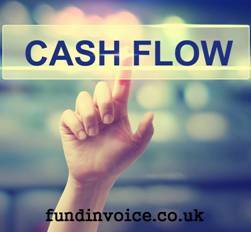 If you need help with your business cash flow position please get in touch with Sean on 03330 113622, as we may be able to help smooth out the cash flow peaks and troughs for you.